Have you ever been in a situation when you realize that your tire is flat in the middle of nowhere and you wish you had anything to fill the tire with? Well, that problem is solved for now. With these portable air compressors, you can actually do this. They are really small in size and can be stored in the glove box or another place in the car. 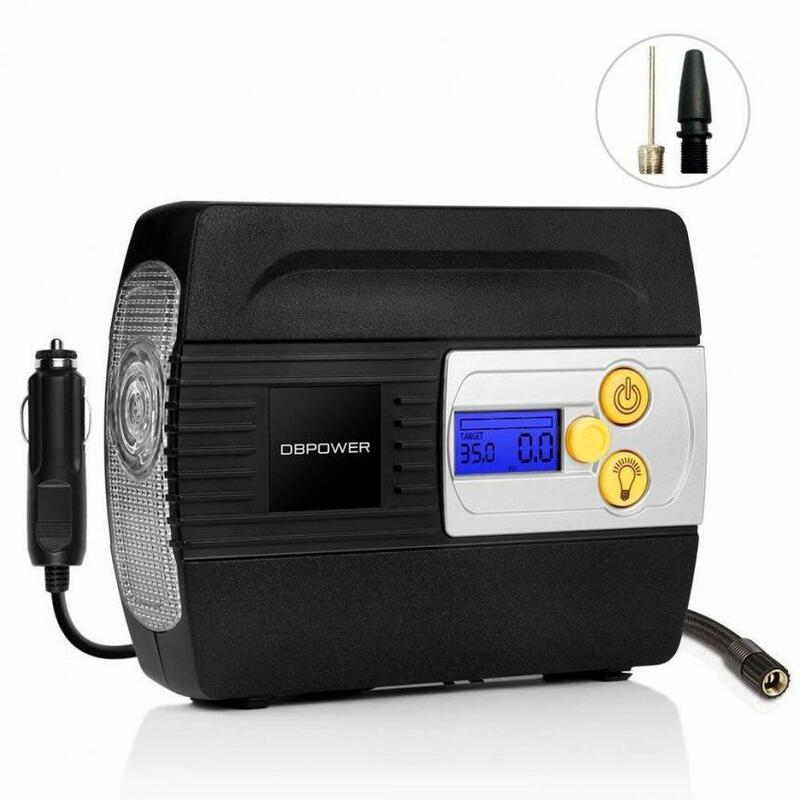 When you are standing at the side of the road with a flat tire, just take out your air compressor from your glove box and start your car and connect the connector to your 12-volt cigarette lighter and follow the instructions of the air compressor to fill up the tire to the desired tire pressure you want. 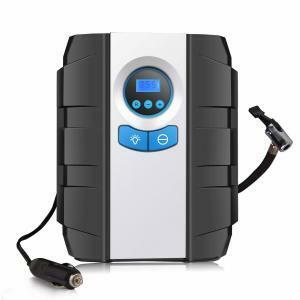 In this guide, we have listed the best portable air compressors for tires to buy in 2019. We have selected the ones that we like the most and ranked them in a top 10 list. This gets to be number one for a reason. The P.I auto store is a brand you probably know of. 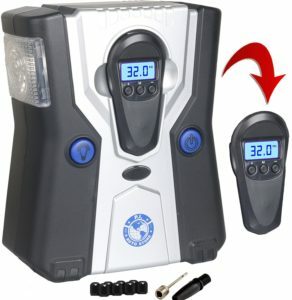 They make good quality vehicle equipment and one of those is their 12 volts DC tire inflator. It’s just the perfect tire inflator in emergency situations. It includes its own means of storage and the size of the tool itself is very small so you don’t have to worry about storing it in your car. In terms of usage, don’t worry as its going to do more than it says. It’s really easy to operate the device. Just unpack it, plug it in your car’s cigarette lighter which gives out 12 volts, and plug the hose onto the tire which is low on air and let the compressor do its work. Once your optimal pressure is reached, you can safely turn it off and get on with your journey. Even if you don’t shut it down, it will switch off the compressor automatically as it features safety cut off when the desired pressure is reached. So what do we say about this particular compressor? It’s a simple, easy to operate and extremely convenient air compressor you would want to have. Most importantly, it can easily run off of 12 volts from the car’s cigarette lighter which every car has. It is also equipped with a bright LCD which makes the job easy if you have to fill your car at the night or another dark place. 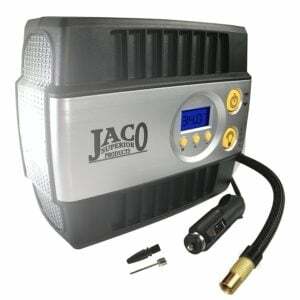 JACO is back, this time with a powerful air compressor for your car. This unit is strong and easy to operate device which is more than enough for all your tires and due to its ergonomic design, you won’t need to worry about where to keep this thing. You can tuck it in a corner in the trunk of your car nicely as you are with using it. If that’s not an option, worry not as you can keep it in your garage without letting it take much space. Other than car tires, this unit will aid you in inflating your motorcycle tires, your kid’s bicycle tires and even your personal pool. One great thing about JACO’s air compressor is that its pressure reading is as accurate as it gets. Correctly inflating a tire is the key to extending its life but that’s when you take the right readings. With the help of this device, that won’t be a problem as the reading will be accurate and you will definitely get the right pressure in your tires, extending the life of all 4 of them. In case you are having any difficulty whatsoever, either with the device itself or on how to use it, worry not as JACO’s customer service will happily guide you through the process. 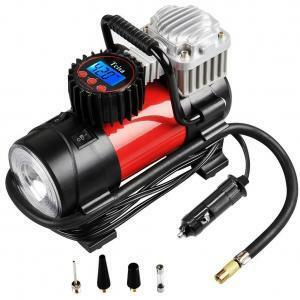 This makes JACO’s SmartPro one good digital tire inflator to have. 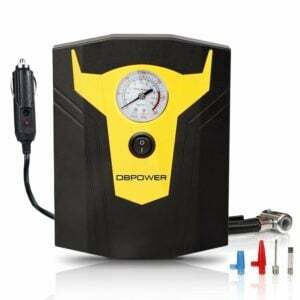 With DBPower’s 12 volts electric inflator, you will be getting a good designed, robust and a quality air compressor. It comes with things like, along 12 power cord which is a convenient little thing to have. You don’t have to keep unplugging the compressor and re-plugging as you manage to reach all four tires. With the long power cable, you’ll get all 4 wheels done with the unit sitting at one place or without movement. Other than that, the motor is a strong and robust one and can fill up your tire in just 5 minutes so that’s a good quality of this compressor. So it’s overall a good air compressor which will keep you company in emergency situations. Black & Decker is a big name in the industry. It has lots of products on the market which are of high quality and are simply well-designed. 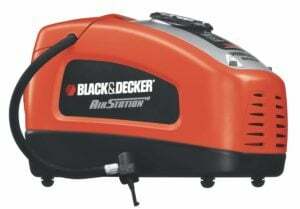 Now Black & Decker is here, with a good tire inflator. It’s without a doubt a solid air compressor to get. Also, there are some features in this unique that makes it stand out than the rest of the compressors. For one, it finally features an option to be plugged into a socket on the wall so there. Secondly, it offers a few different nozzle adapters to cater the needs of different types of tires and other things. But with one gain, you lose something. This unit, unfortunately, does not feature a modern LCD with controls but rather the old styles dial so this is where the unit falls behind. It becomes a little difficult to adjust the settings. But even with the downsides, this unit makes a good air compressor to use in emergency situations and includes wall socket adaptor which many brands don’t offer in their units. Includes a wall socket adaptor but with a permanent fuse. From Tcsia, you get a nice little package containing a cool looking air compressor that has the ability to pump a tire up in just a minute. That it’s just great for a small device like this! Along with that, its power cord is made strong so that it can bear a bit of pull when working with the unit. It has a nicely fitted LCD with a backlit which is bright enough to be used in the dark as well as in the day so worry not about having to squint under bright light or in the dark when needing to check the tire pressure. That LCD can even act as a flood light so you don’t actually need to keep a flashlight with you! This unit is a little heavier than other air compressors out there. With EP’s Auto 12 volt DC compressor, you will get many features. It’s simply not just for car tires but a very versatile and dynamic tool which will give you a hand to inflate other air-related things as well. This unit may be a tad bit larger than many other units you may get as alternatives with a smaller size but that should not hold you back much. It is a bit heavy a weighs about 4 kilos. This unit has a strong motor with almost unrestricted air flow. It also features an LCD display and safety feature of auto compressor cut-off in case the max pressure is achieved. Included with the package is various different types of nozzles to cater needs of different nozzle requirements on different things like mini pool, motorcycle tires etc. One different feature in this unit is the safety feature that is related to overheating. Yes, air compressors often heat up as the air inside is compressed. With this unit, if the compressor happens to heat more than it should, its safety feature will automatically shut the compressor off to prevent damage to itself and its surroundings. That’s a pretty cool feature that all units should have. Also, it includes the usual auto compressor cut-off when set psi is reached so overall this is a good piece of equipment. This particular model by DBPower is compact enough and still much powerful to be on this list. It’s as light as being only about 2 kilos to weigh, making it the smallest unit in this list. Its small size doesn’t make it a bad unit. It’s just as rigid as strong built as small and functions like other units in the market. It’s powerful enough to fill up your tires as quickly as possible without heating too much. Actually, to emphasize the fact on how powerful it is, it can inflate up to a max 150psi pressure which is more than enough in almost every household application and not just that but, it can inflate a tire just 5 minutes. In addition to the unit itself, you get different nozzles for different applications so you don’t need to get a different unit for different use which makes this thing a dynamic little compressor unit. The Ryobi’s P737 18 volt is a different type of air compressor and stands apart from its counterparts. A big change in this unit is that it does not include a power cord. It’s actually a cordless one. Neat isn’t it? Not really. 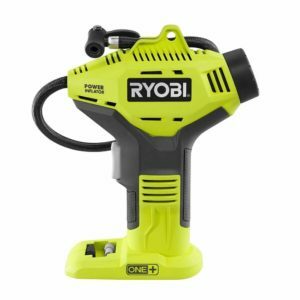 Unless you’ve used other tools from the Ryobi family, you won’t have the battery needed to power this thing up. Batteries are not included with the unit as already mentioned, it doesn’t have a cord to get the power from. To use this unit, you will need to get the power pack separately. So if you have a good enough budget, this will come in handy as there are no wires to trip on but other than that, it’s not a good unit in emergency situations. The lack of battery and no way to plug it in really is a drawback even with the features considered. Although the design and make quality is good, this does not make up for the missing components. This unit features auto compressor cut-off when max tire pressure is reached and it’s a versatile unit that will get your play ball and mini pool properly inflated too. It’s small, lightweight and very easy to operate. Helteko is one brand that knows what its users want. Their digital tire inflator mode is made to be a modern style, with a stylish design, tire compressor but keeps a sturdy design making the unit robust. 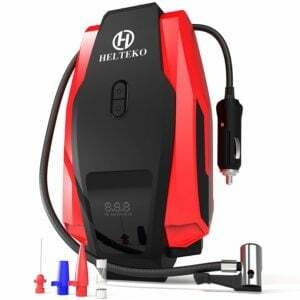 The unit is small enough to be extremely handy but keeps all the functions of a good tire inflator intact. This unit is as small as many other tire inflator models in this list and weighs less too. But that doesn’t mean you are getting a weak motor with this one. The compressor is just as strong as other compressors in this list so worry not. A good thing about this unit is that it includes a number of different nozzle types so that it can be used for applications other than car tire inflating such as motorcycle tire inflating, fixing the mini pool and even kids’ play balls. Overall it’s a sturdy and durable unit and made with high-quality plastic material as covered by chrome steel to keep it safe. This makes this unit good enough to be used whenever and especially in emergency situations when tires await inflating. Doesn’t come with a storage case. Dawn is one of those brands which are not as popular as the others on this list but still, that doesn’t mean they don’t deliver. About Dawn, we can say for sure that its air compressor is good enough to be on the list. It is made of high-quality materials and does the job perfectly. It’s a compressor that waits for an emergency situation to come out of the trunk. The size is where this compressor wins. It’s small enough to not exceed a length of 10 inches from each size and weighs about 2 pounds so its lightweight as well. Unfortunately, it does not include a storage box to keep it in but it’s small enough to be stored in tight spaces despite it. A good thing about it is that it comes with a power cord and extension air hose so it makes your work a lot easier. You may say the lacking of the storage box is bad enough but really, the fear of scratching it goes down as you can store it in some bag you already own. Overall, it’s easy to operate the device with an ergonomic design. It’s small enough to fit in your toolbox if you don’t mind a few scratches. That won’t really affect the operation of it. 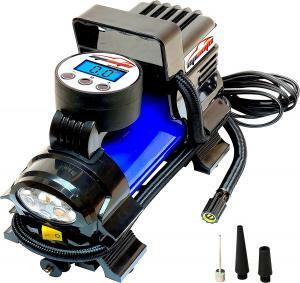 A portable air compressor is an electric pump that is used to inflate or deflate your tires on your car. It compresses air and store it in a tank and can fill up the tire with the required pressure. Are there different types of portable air compressors? There are several different types of portable air compressors. The one we are mentioning in this article, are those that are small and can be stored inside a car. There is also both 12/110/240 volt available. Normally big air compressors are used in the workshop to drive air driven tools and require a lot of power. But, the portable air compressors that we are discussing in this article, are small in size and are made to be able to carry in your hand and fill up your tires fast at the side of the road or at the garage in your home. There are some things that you should check after when you are looking to buy a portable air compressor. Choosing the right one can be really tough, but there are some things you can check for to make it easier. One really important thing to check is the max pressure the compressor will produce. You do first have to check how much pressure your tires require. Normally these compressors in this list will produce between 100-150 psi max pressure, which is much more than enough for the most tires, but you want to make sure it can fill the required pressure if you have tires that require a lot of pressure. Normally a tire pressure is around 40 psi and you have to make sure that the compressor can produce it. A Led light is a great function to have if you realise that your tire is empty in the night or at another dark place. Check for an air compressor with a strong LED light, or you have to make sure you always have one external light with you inside the car. The wire length of the air compressor is really important. You have to make sure that the length of either the 12 volts or the pressure hose is long enough to reach from the connector to all your tires on your vehicle. Sometimes the 12-volt connector is fitted in the trunk of the car and you have to use a long wire to reach the front tires. The speed of the air compressor is another important thing to look at. You do not really want to stand there at the side of the road in the middle of the night and wait 20 minutes for the tire to fill up. Choose an air compressor with great speed. The weight and size of the air compressor are important if you want to store it inside the car. The most of these tire infiltrators are small and can be stored in the glove box, but some are larger and bigger and can be difficult to carry if you are not very strong. Checking the quality of the tire pressure compressor is important. It’s hard to check the quality over internet, but there are many review on youtube and even more at Amazon under the specific product from real customers. Read these reviews and I’m sure you will find something about the quality of the product. If you don’t have the correct tire pressure in your tires, you will notice a significant difference as you turn the steering. It may feel heavier than usual. That is because of low pressure in the front tires. Also if you experience low gas mileage, that could also be related to the wrong pressure in the tires. An underinflated tire is as dangerous as overinflated tires. That’s because, without enough pressure to keep the car up, the tires will take extra pressure on themselves and with the rim coming upon them, the tires will start to tear with the weight and rim edge. Eventually, your tire will lose its shape and as it’s inflated again, you will see signs of tear around the face of the tire. Similarly, overinflated tires will wear them out quicker in an uneven pattern – it’ll additionally have an effect on the surface grip as the tire might not be completely grabbing the raid to maintain grip and decreasing braking and performance in critical situations. So now you understand why over inflated or under inflated tires are bad. The question after that is how to set them to the correct pressure? Different car models use different car tire pressure.. By all way take this as an indicator, however, it’s good to note that your tire might clearly be if you fill it with the exact pressure stated on the body inside the driver door or in the owner manual. For basic driving, a good habit is to note the correct pressure for your tire and fill it 10 % more than the stated pressure. With the intention to provide a great indication of an appropriate tire pressure. Older car tires did have a tendency to worn out in the middle of the tire if you had too much pressure inside it. Nowadays you can drive with a bit higher pressure than stated with a good confidence. You will actually get better fuel economy and steering ability and the tires won’t wear out in the middle like the old ones. Worth mentioning is that we are talking about 10-15% over the stated pressure. Over that can be dangerous and make your car bouncy and loss of steering may occur. You will also wear out your tires faster and there is a risk of a tire explosion. Worth mentioning is that you should always fill your tires when the tires are cold because when the tires are hot, the pressure inside them increases and what will happen if you fill it with 2 bar when they are hot? Yes, there will probably just be like 1.5-1.8 bar inside them when they are cold, which is not enough pressure. A huge distinction between the cheap portable tire inflators and the highest priced models is convenience. The less expensive models are a less difficult buy to make, however, they truly aren’t handy to apply extra than while without a doubt essential. They’re painfully slow, and maximum require quite a few cooling breaks as you pump. As an end result, you’ll spend as much as 3X longer inflating your tires as you might with a pinnacle-shelf version. That’s why we advise that people who are going to be servicing their tires often or retaining multiple cars buy something a chunk nicer and more efficient to use. Even small time differences can upload up quickly after you start searching at four tires, or 2 vehicles. If alternatively, you’re shopping for a handy tire inflator as a “just in case” device to get on the road after a flat, you probably won’t mind spending 15 minutes to pump up, so long as you could get on the road without watching for a tow truck.